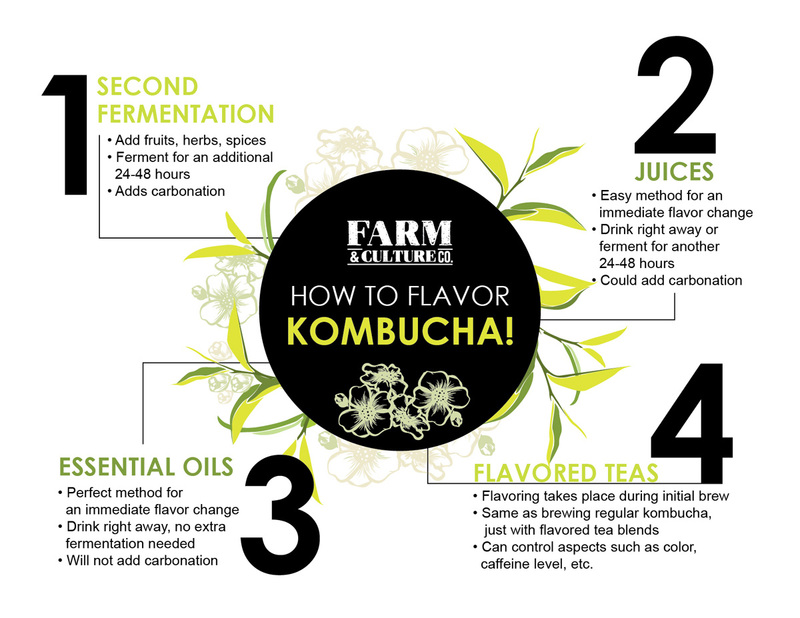 How to Flavor Kombucha - Farm & Culture Co.
Today we are going to be discussing how to flavor kombucha. There are four methods I use at my shop that I think are the most effective, and I am excited to share them with you! 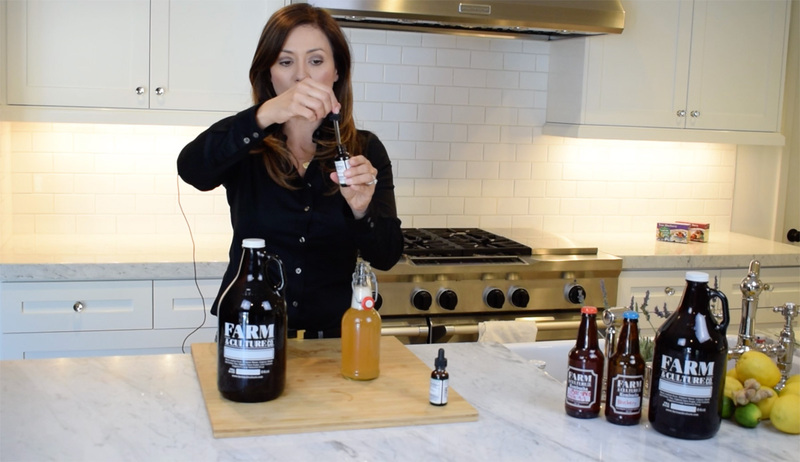 Flavoring kombucha is definitely the most important part of the process; it determines whether it tastes good or tastes terrible, and whether you can convert non-kombucha drinkers into happy kombucha drinkers. Just remember, it tastes great everyone will drink it! The first way you can flavor kombucha is by starting with plain kombucha and adding different flavors into the batch for a second fermentation. This helps with the carbonation as well. So, you want to start off with your plain brew and fill your bottle about 3/4ths of the way. Then you add your flavor; and you can choose whatever flavors you like. It’s great if you happen to have some herbs in your vegetable garden or some berries in your yard that you can use. I like adding some lavender and sliced ginger. If you use ginger you’ll want to leave the skin on because there’s actually a lot of bacteria on the skin that help with the carbonation process. I also add a little lemon for a lemon-lavender flavor, which is delicious. You then want to fill up the rest of the bottle and get as close to the top as you can, because it also helps the carbonation process. Put the lid on, and let it sit for 24 – 48 hours. During this time the kombucha is still feeding off of the sugar and fermenting, which, in turn, helps with the carbonation. The second way of adding flavor to your kombucha is to add juice. 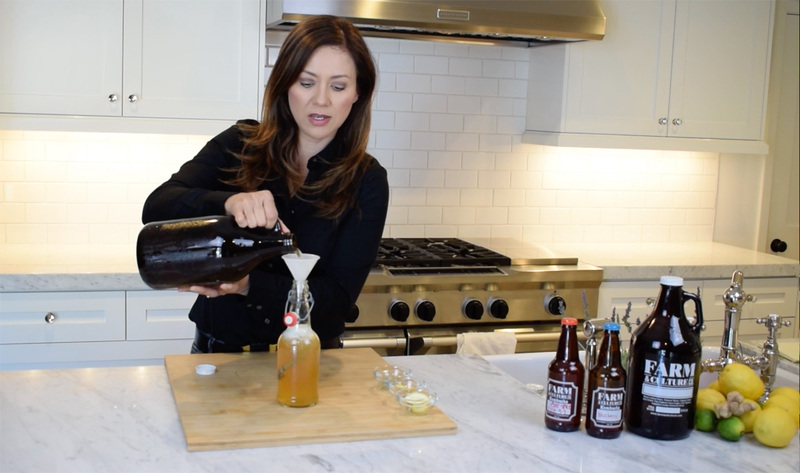 This method is super simple; just add your favorite juice to your kombucha and you’re done. I’m going to show you how to make lemon-lime, which is one of our most popular flavors. I start off with about a tablespoon of lemon juice, and a tablespoon of lime juice. The amount may vary depending on how much kombucha you’re flavoring. I just make it equal parts. At the shop, I typically brew in five-gallon batches so I will use two cups of each flavoring. Once you’ve added your juice to the bottle, just add your plain kombucha! This will be ready to drink immediately, or you can put the lid and let it sit for another 24 – 48 hours to add a little more carbonation, and then move it into cold storage. Adding juice is definitely one of the easiest ways and is really fun because there are a lot of really interesting juices out there and different juice blends that I don’t always think of, so it’s a way of always keeping your kombucha fresh and new. The third way you can flavor kombucha, and this is great way to fix a batch that you might be unsure about, is by adding essential oils. 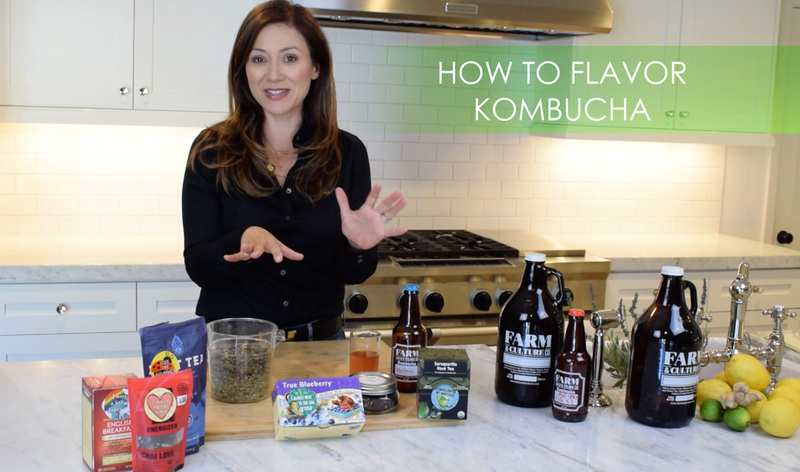 You’ll start off with whatever kombucha you want to add flavor to, whether it’s plain or already flavored, and you take whatever oil flavor you like and add a few drops. I like using peppermint and basil, which are extremely strong so I only add a few drops. This method is nice because it’s not juice, so you won’t be adding any extra calories. And that’s it! All you do is add your essential oils and you’re ready to go. The fourth and final way to flavor kombucha, which is also my favorite way, is to use flavored teas. You add this flavoring in when you brew your first batch of kombucha, or your original fermentation, which means that you’re adding in the flavor right from the start. It definitely results in great flavor, and you have the benefit of not having to do that second step or having to add any extra sugar that comes along with using fruit or fruit juices. So, when you begin your brew, you still use your kombucha blend, which is a blend of green tea, black tea, yerba mate, and other herbs. Then, you pick a flavor! You can choose anything you want. At the shop we have a hibiscus blend that’s really popular, a blueberry, and a sarsaparilla root, which if you add a little bit of ginger to ends up tasting like a kombucha root beer. Today, I’m going to open up a bottle of blueberry kombucha, which was brewed using the house tea and the blueberry tea. You’ll notice how it changes the color of the brew. This will also flavor your SCOBY and your starter tea, which is a little tricky but easy to manage once you get the hang of it. 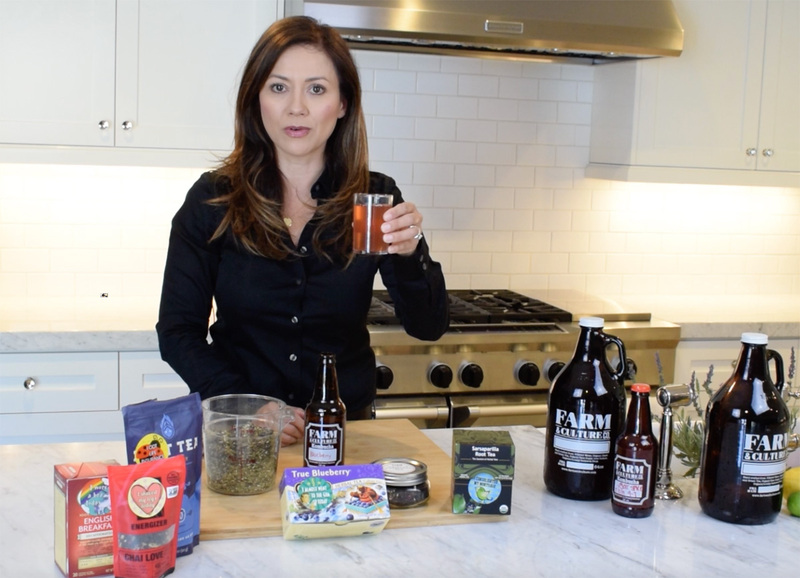 Feel free to experiment with all of these different ways of flavoring kombucha. The flavored teas are definitely my favorite right now because they’re fast, cheap, and easy. One quick thing I want to mention is that you can control the caffeine levels in your kombucha too depending on the tea that you use. For example, there are some teas out there that are super high in caffeine where others are not caffeinated at all, so if you’re sensitive to caffeine or have kids you can take out the caffeine altogether by using a decaf blend. I hope this helps with all of your flavoring questions and ideas! Be sure to sign up for the newsletter for new recipes and flavors, and check out our recommended products page for more information. Also, feel free to follow and message me on social media—I’d love to know how it’s going and what new flavors you’ve tried or have come up with!